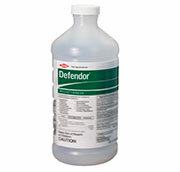 Defendor specialty herbicide is a postemergence product that controls dandelion, clover and other high-anxiety weeds. Because it performs in cold weather when nothing else works, you can apply Defendor in late fall or early spring and see the same superior spring results. It is now sold by itself in a 1-quart jug or in a 1-gallon container in a Value Pak with Dimension® 2EW specialty herbicide. Defendor can be applied to cool- and warm-season turf. For more information, visit FewerCallbacks.com.